Introducing: Media Kit & Stock Photo Templates for Bloggers! Every month, we like to bring you something new to look forward to as an SC Sister. Last month we introduced the SC Sister Map for planning coffee dates to teaming up for sponsored collabs with other bloggers who live near you. We believe that working together creates more opportunity than trying to go at it alone! An easy to use media kit download with a step-by-step tutorial. Beautiful stock graphics with a video tutorial. Learn more about the sisterhood. At Style Collective, we’re all about helping influencers connect, grow, and learn on their journeys to becoming successful bloggers and entrepreneurs. When you join our membership program, you’ll have access to all the resources you need to become the bossbabeyou’re meant to be, including an educational library, our e-courses and guides, our unique resources – and, of course, our amazing bossbabecommunity! Want something more?The Influencer Growth Roadmap is a 10-week program to help you level-up as a bossbabe and entrepreneur. These weekly guided coaching program will take you through four incredible workshops (plus some awesome bonuses) so you can start monetizing your passion. Are you ready to create a media kit that attracts brands? We’ve given our media kit template a much-needed refresh! There are two options for you to choose from and both can be edited in Microsoft Word so that anyone can do it! We’ve also created a video tutorial in case you need some help or want to brush up on your skills. Remind me again… what is a media kit? 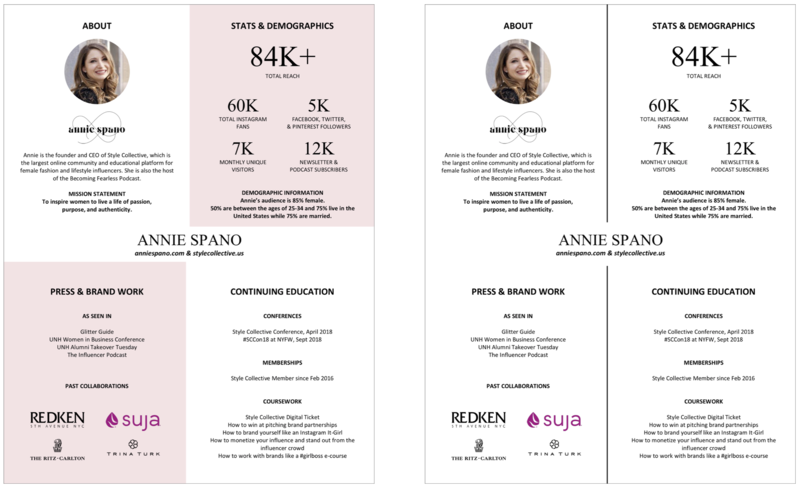 A media kit shows a brand who you are and includes important stats to show your reach. A media kit is typically given to a brand to start the conversation about a sponsored opportunity. What does a media kit usually include? And we added a NEW section to our media kit: Continuing Education. Because any memberships, courses, events, or conferences should be included on your media kit to show brands that you have the knowledge and credibility to do the job right. So go on girl, add your SC membership to your media kit! It’s a strong differentiator that you should be proud of! Are you ready to level-up your brand with gorgeous stock photos? We are so excited to be partnering with Her Creative Studio to bring you monthly stock images to use on your blog, social media channels, and email newsletter! We have a membership to the studio, and we use these exact photos for Style Collective’s branding. We wanted to share our love of Sandra’s stock photos with you, and we were so grateful when she agreed to give SC Sisters access to a curated collection worth $600+ for free! Our goal is to add something new every single month to help you reach your goals. Building your brand is a slow build and takes time, but we hope that the community, education, resources, and, templates you receive from being an SC Sister help make the journey a little bit easier and more fun! We can’t wait to share some sneak peeks of what we are working on next!